Today has been one of those glamorous workdays when I eat lunch at my desk — specifically, half of a day-old turkey wrap from the Pine Street Deli (which had been delicious when fresh) and some stale popchips. Such is the last day of production on 7Nights, our annual, 136-page dining guide, which shipped to the printer early this afternoon. This is a momentous day for another reason, though: It's my last one at Seven Days. I joined the paper in January 2011, and over the past three-plus years have chalked up enough culinary and liquid adventures to fill a book (or at least generate hundreds of articles and blog posts). I've also gotten to know some incredible people (coworkers, chefs, farmers, brewers, distillers and others), eaten innumerable kale Caesar salads from Bluebird Coffee Stop at the Innovation Center, and gained a well-earned 12 pounds. (When I see my family or distant friends now, they say, "You look ... healthy." Earlier this week, Citizen Cider launched its new Pine Street tasting room with a series of soft openings; on Monday night, that meant I got to convene with a room full of food- and ag-world peeps while sipping a glass of crisp, wonderful Cidre Bourgeois. I'm bummed to leave Burlington just as this place opened. Le sigh. I sit in a portion of the 7D office known as "the nook," and the four of us who occupy it (or have occupied it) call ourselves "ladies of the nook." We convened for lunch early this week at Lucky Next Door, the sister eatery to Penny Cluse Café. 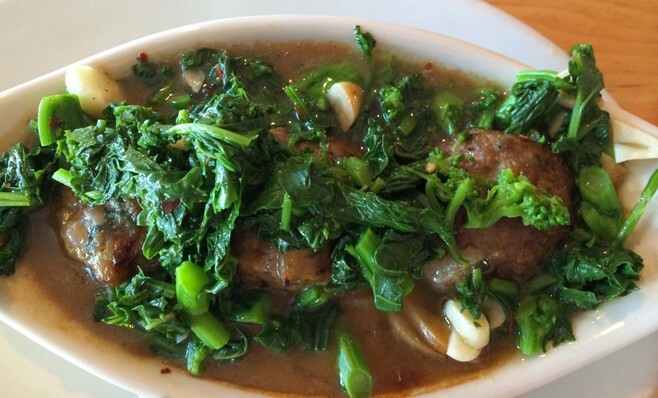 I blissed out over a bowl of tender beef-and-pork meatballs and piles of broccoli rabe in garlic-heavy brown gravy. 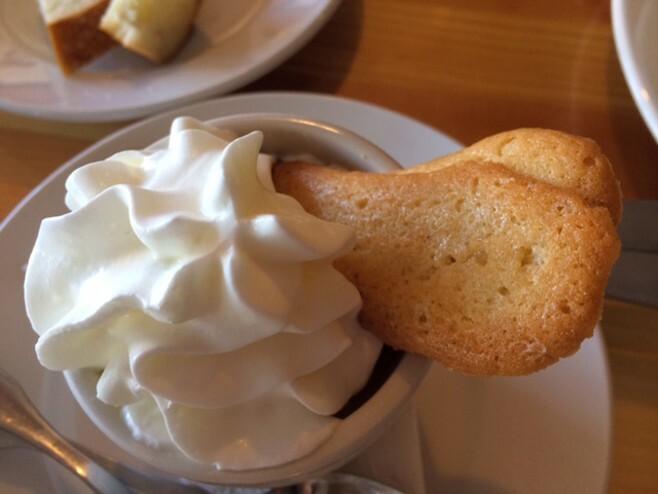 It was truly a perfect lunch — made even more so when the kitchen sent out a ramekin of silky caramel custard. Once you've tasted it, you may wake up in the middle of the night craving more (as I did). That evening, I met a few friends, acquaintances and strangers at Hen of the Wood in Burlington for a full-on oyster hoedown. It had been organized by Melissa Pasanen, food editor for Vermont Life and contributor to the Burlington Free Press — with whom I've talked and emailed many times but somehow never met. 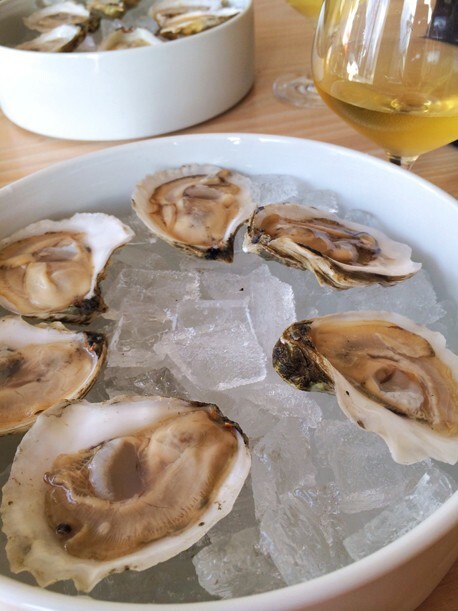 Melissa was gracious and fun, and won our hearts by asking the restaurant to pre-chill a 3-liter bottle of Domaine de la Pepiere Muscadet Sevre et Maine to go along with the seven dozen briny Katama Bay oysters that seven of us downed. Ever held a three-liter bottle of wine (see left)? It's a serious weapon — though what lurked within was deeply elegant. For months, my friend Wendy and I have been trying to make plans to meet up at Vergennes Laundry for late afternoon oysters and Champagne. While I avoided bubbly — instead, I went with an entrancing Haut de Sanziers Saumur Blanc 2010 from the Loire Valley — we soaked in the slanting sun while savoring buttery Standish Shore oysters from Duxbury, Mass. It was such a relaxing vibe that we lingered for more wine, a kale salad and completely dialed-in charcuterie (as well as some of the most incredible bread and butter I've ever had). In little more than a week, I'll begin a new job as an associate editor at a business magazine called Convene, which will take me to New York City (and further afield) a few times a month. My nomadic soul is looking forward to roaming — but my food-obsessed soul is hanging its head low.